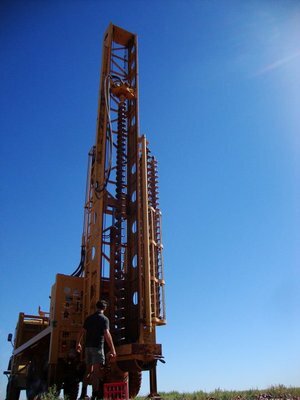 Mining for Opal in Coober Pedy, Australia! 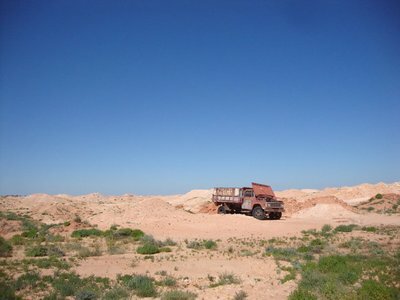 Frontier life in the Opal Mining capital of the world. Our first venture into Central Australia. Where copious amounts of flies and mosquitoes are your worst nightmare and water is scarce. 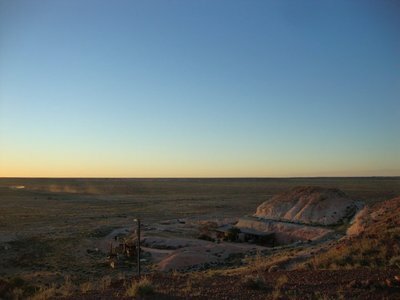 Coober Pedy, situated a 1000 km north of Adelaide along the Stuart highway is a place literally surrounded by hundreds of miles of nothing in every direction. It’s a place for outcasts and adventurers. A place where real rebels can feel at home. After crowded coastlines and busy, polluted cities, our true outback adventure starts here. 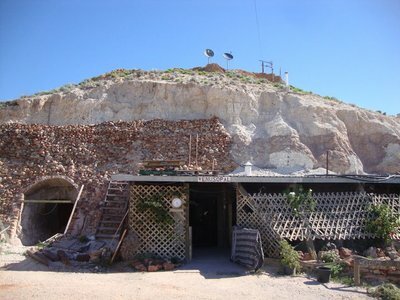 Coober Pedy is known for its opals and dug-out houses and thus has placed itself on the tourist map. Opalized fossils of dinosaurs are world famous finds in this territory. Opals are basically gems from a long gone desert sea. As most of Australia was underwater up until 120 million years ago. 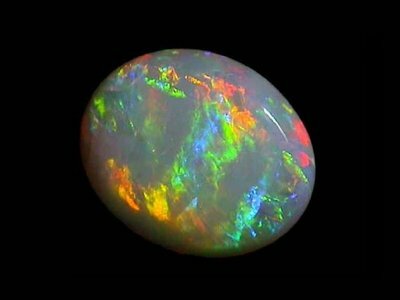 Pieces of opal show a brilliant spectrum of colors which is quite unusual in a stone. It has the unique ability to split white light or ordinary sunlight into beautiful colors and is therefore extremely rare and valuable. So can you blame all these opportunists still trying to live the dream? 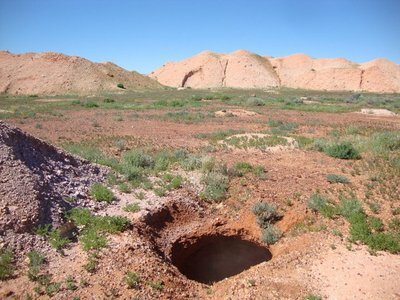 Coober Pedy supplies about 80percent of the world’s requirement for opal. It all started with this young fellow about a hundred years ago, looking for some water for his family’s exhausted form of transportation, their camels. He stumbled upon something shiny and precious looking. Not long after, people starting digging and holes, that seemed no longer useful for finding opal, were used as housing..
We stayed with an Austrian Opal Miner in his large and very comfortable dug-out. We helped renovate an extension to the house in return. 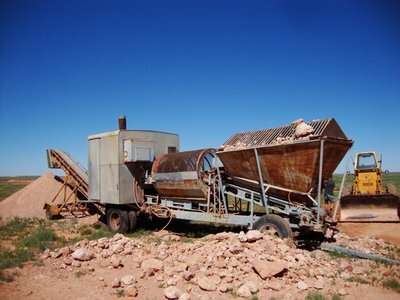 It was a true Coober Pedy experience, which people usually pay big bucks for. The Aborigines didn’t name it ”White man in a hole” for nothing. ( Kupa = white fella / Pedi = hole in the ground). Thursday night, everybody goes to the local pub, including us, and the locals are extraordinarily friendly. This is where we got asked to sign “The Petition”. The company in charge of the electricity and water supply in the area had just announced that it would raise its prices about 300 percent…We had just read about it in the local newspaper and thought it was an outrage. How dare the government not do anything about this! These folks, who obviously don’t have a choice, are already paying unaffordable bills. 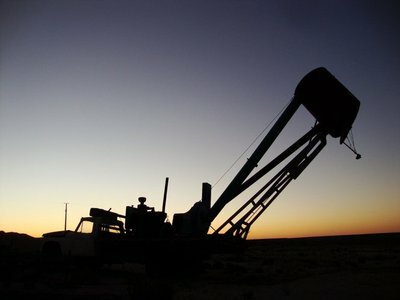 Coober Pedy is one of those places where buying a simple thing such as a bottle of water will set your travel budget seriously back. 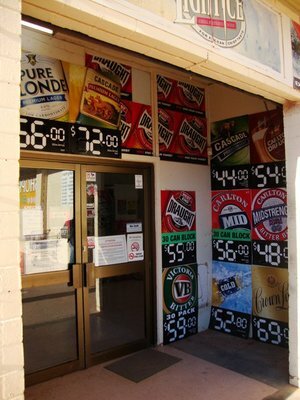 Have a look at these beer prices. Even though all of the folks we met and had conversations with, were all very genuine and warm hearted, there was one thing that struck us as unusual. Here in the middle of nowhere, far into the outback, nobody seemed to speak highly of the ”Black Fellas”. We had encountered the Aborigine culture in the cities, seen the art work in the museums, heard their story over and over again and agreed that it was very sad indeed. So when we arrived into this part of the country where their numbers were far greater and the chances of seeing and experiencing their lifestyle were very real indeed, it turned out to be a bit different than we had expected. 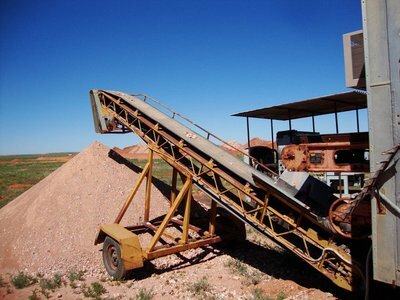 The first thing you see when you enter Coober Pedy is an abandoned city where aborigines aimlessly walk along the streets, sometimes sitting in groups gathered in the little shade a tree in the parking lot could offer. People usually try to avoid being outside for about 8 or 9 months out of the year during the hotter part of the day. The indigenous people though don’t really seem to mind and they don’t seem to care about their appearance either. There’s a certain sense of entitlement hanging in the air and I can surely understand why. It’s a complicated situation with a probably equally as complicated solution, but so far all the Australian government has been doing is throwing a fair large amount of money at the Aboriginal community. Some of them certainly didn’t mind coming up to us, to ask for a few dollars as if they were homeless and then immediately afterwards went inside a bottle shop (liquor store) to buy a cheap cask of wine. Alcoholism, certainly seems to be the major issue within all communities across the country. We were told that what you see on the streets are the outcasts. They have been kicked out of their communities because of bad behavior. These communities seem to keep to themselves though and we have yet to go visit one of the many found scattered around the outback . We heard nothing but good things and are certainly looking forward to finally meeting some of these exceptional people. There were many stories told to us by different locals about the many incidents that had occurred involving that one kind of Black Fella. I guess it’s the same anywhere right? Us, White Fellas try and stay clear from the troubled ones as well now, don't we? It’s all relative in the end. 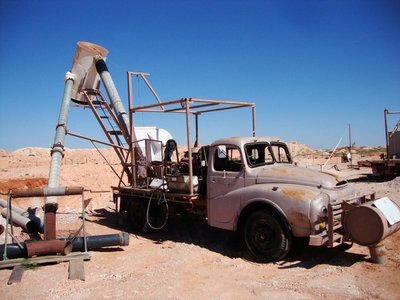 All in all, I’d say our Coober Pedy excursion was a major success. We found some opals… I’ll admit it was in our hosts backyard, though. They were the chunks he didn’t value much and had thrown away. They still looked like little treasures to us! !